The British biographical publication Who’s Who of 1942 records that Edward Wakefield and Tom Hickinbotham, the Political Agent A mid-ranking political representative (equivalent to a Consul) from the diplomatic corps of the Government of India or one of its subordinate provincial governments, in charge of a Political Agency. at Kuwait, circumnavigated Warbah, an island in the Gulf near the mouth of the Euphrates. However, some twenty years after they retired from imperial service, it was admitted that this was not such a spectacular feat after all. In March 1961, an Associated Press article by Eddy Gilmore was reproduced in several newspapers under titles such as ‘Hoodwinked by Hickinbotham’, ‘Rawther A Joke on ‘Who’s Who’ [sic]: Blokes Sailed Around Warbah’ and ‘Who’s Who Learns What’s What: Staid Volume Used to Keep Joke Going for Years’. ‘Two distinguished Englishmen’, Gilmore reported, ‘admitted Friday they’ve been playing a joke for years on that staid and authoritative annual volume “Who’s Who”’. Hickinbotham was quoted as saying: ‘It’s all rather a joke. Warbah Island is, in fact, a mudflat in the Persian Gulf Historically used by the British to refer to the sea area between the Arabian Peninsula and Iran. Often referred to as The Gulf or the Arabian Gulf. , only just visible at high water’. He continued: ‘One day I said to Mr Wakefield, “See, nobody’s heard of Warbah Island”. So we decided to put it on the map by sailing around it in a launch’. Some newspapers put this prank down to the fact that imperial service in Kuwait ‘was all deadly boring’. Hickinbotham alludes to such boredom in a personal letter dated August 1942 to William Rupert Hay, Political Resident A senior ranking political representative (equivalent to a Consul General) from the diplomatic corps of the Government of India or one of its subordinate provincial governments, in charge of a Political Residency. in the Persian Gulf Historically used by the British to refer to the sea area between the Arabian Peninsula and Iran. Often referred to as The Gulf or the Arabian Gulf. . 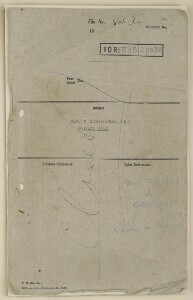 Comparing his temporary position in Kuwait to that of a family doctor, he writes: ‘He has no authority in the household while the family health is good [...] Most people loath to call in a doctor while they see hope of unaided recovery […] They are particularly unwilling to take their troubles to a locum tenens’. The following week, perhaps in an attempt to lift Hickinbotham’s spirits, Hay sent him twelve bottles of Persian wine. One way of combatting this boredom was reading. Hickinbotham’s ‘Private File’ contains correspondence with booksellers, such as Thacker & Company Ltd. and The Times Book Club, providing details of the books that Hickinbotham procured for himself and the Agency’s library. Certain books could be a means of continually legitimating the imperial mission of which Hickinbotham was a part, although they could also simply serve as a form of escapism. The books Hickinbotham bought included biographies – verging on hagiography – of imperialists, such as The Life of Sir Percy Cox: The Amazing Record of a Great Imperialist by Philip Graves and Allenby: a Study in Greatness by Archibald Wavell, as well as statesmen, such as The Duke and Palmerston by Phillip Guedalla and others associated with Orientalist adventure, such as Sir Richard Burton’s Wife, by Jean Burton. As a result of the Second World War, books such as Guedalla’s Mr Churchill and Winston Churchill’s own, The World Crisis were also procured. Such books could act as a form of self-perpetuating imperial propaganda for a man like Hickinbotham, who was both reading about and also actively participating in the construction of Empire. Publishers advertised to colonial officers by means of regular mailings of ‘Latest Arrivals’, which listed books in two sections: ‘Novels’, for example Columbus by Rafael Sabatini and The Moon is Down by John Steinbeck; and ‘General Literature’, which focused heavily on the Allied war effort, with titles such as Hutchinson’s Pictorial History of the War and Hitler’s Darkest Secret: What he has in Store for Britain by Richard Baxter. Tailored advertising could also target the boredom and potential sexual frustration of a single, colonial officer away from home. One such example is a card fixed to a letter from Thacker & Company advertising Eric L. Dunn’s titillatingly titled Boudoir to Bar Stories, a book of jokes and stories that ‘will throw you into rollicking riproars’ advertised as ‘For Men Only’. The Empire was indeed boring. This was not because India, Kuwait or any of Britain’s colonies were intrinsically mundane places, but imperial administration itself was increasingly banal. Jeffrey Auerbach notes, ‘British administrators at all levels were bored by their experience travelling and working in the service of king or queen and country’ because ‘the empire’s “civilizing mission” was truly a banal affair of administration’. The increasingly bureaucratised and ceremonial nature of the Empire resulted in a situation where ‘reality simply could not live up to the expectations created by newspapers, novels, travel books, and propaganda’. The Empire had long been constructed as a site of excitement, exploration and Orientalist fantasy, developed through the consumption of various literary forms that portrayed imperial service as thrilling, adventurous and exotic. Notwithstanding some exceptions, colonial officials, Auerbach concludes, ‘were deflated by the dreariness of their imperial lives’ and ‘desperate to ignore or escape the empire they had built’.